Meenal Khandaker is an enterprising senior at Burlington High School who is very passionate about her interests. She has striven to challenge herself with numerous AP and other stimulating courses. Her favorite classes in high school include AP Biology, AP Language & Composition, and Anatomy & Physiology. This year she is taking three science courses. She hopes her course load will help her achieve her childhood dream of becoming a pediatrician someday. Meenal has immersed herself in her pediatric ambitions throughout high school. She volunteered at Lahey Clinic for three consecutive summers and attended an exciting medical congress in which she viewed surgery. She joined the Medical Careers Club as a freshman and took on the role of Vice President as a sophomore. Meenal has also gained experience in working with children. She has been an assistant dance teacher for five years, assisting children from ages two to eight. She volunteered as a classroom assistant in both the preschool and Memorial Elementary School's summer program. Currently, she is a Playspace Manager at Horizons for Homeless Shelter. She has enjoyed helping children through her involvement in the National Honor Society, engaging in activities such as shoe-making and raising funds for Schools on Wheels, as well as in Amnesty International in which she has written letters about injustices against children. Beyond academic work, Meenal engages in many extracurriculars. She is enjoying her fourteenth year of dance and eleventh year of figure skating. She is a competitive soloist and member of the Senior Dance Company at Miss Louise's School of Dance, performing all styles of dance. She also loves Bollywood dance, and has been the President and Choreographer of the Nach Le! Bollywood Dance Club at BHS throughout high school. She has also written for the school newspaper, the Devil’s Advocate, gaining the role of editor-in-chief as a sophomore. Meenal is excited to study pre-med in the future and hopes that whichever college she attends will have as much opportunity as BHS! Amanda McCombs is a senior at Burlington High School. She has a passion for learning and feels grateful for the fulfilling education and many opportunities the school provides. She is additionally appreciative of all her teachers for guiding her during her high school career, as well as the faculty and staff for their contributions to making the thriving and welcoming environment that she has experienced in the school. Through her hard work and dedication, Amanda has achieved high honors or honor roll for every quarter throughout her high school career. 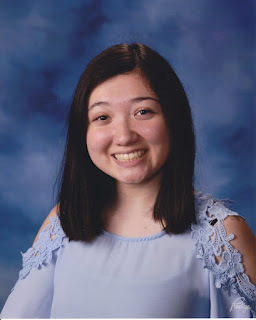 She has attempted to challenge herself in her course load, having taken AP Language and Composition and AP Chemistry as well as being currently enrolled in AP Literature, although she selects her courses with a stronger focus on what she has passion for learning about and on what each class can provide to her education and exploration of subjects. She is most interested in English, art, and Latin, and is currently taking honors Latin V.
Amanda enjoys getting involved in several school extracurriculars. She is co-president of the Latin club as well as head editor for art in the school’s literary and arts magazine, Collab. She is also a member of the photography club and Girl Up and is in the vocal ensemble in this year’s spring musical, Pippin. Additionally, she has been admitted as a member of the National Honor Society as of junior year. Outside of school, she has enjoyed engaging in volunteer work, some of which has included at the Burlington public library as well as the Sunrise Senior Living Center. Next year, Amanda is attending UMASS Amherst in the Commonwealth Honors College and plans to major in English. She is open-minded in her future academic path and is excited to further her education.